May might be my favorite month. The energy of spring swells in every living thing. I remain in awe of all the energy. A Catbird sings all night outside our open window. Robins begin their singing at 5:15am. That’s the warm-up for the avian symphony that will last all day. I heard a Black Poll Warbler in the yard this morning as squadrons of Chimney Swifts flew overhead. When the Black Poll passes through on its way to the Artic to breed, the other late migrants should be here as well: Yellow Billed Cuckoos and Dickcissels. 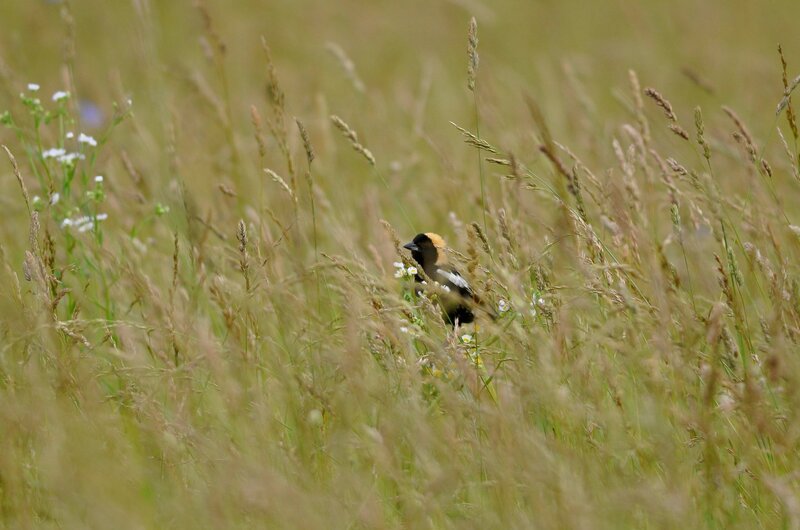 Male Bobolink. Photo by Amy Johnson of the Smithsonian’s Virginia Working Landscapes. 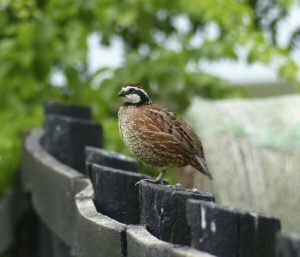 A male Northern Bobwhite in our backyard. I can hear Bobolinks and Bobwhites everyday here in Swoope. The Bobolinks have the craziest song I have ever heard from a bird (it has a double larynx) and they are so strikingly beautiful in their black and white tuxedos with little yellow helmets. They will nest in our cool-season pastures along with the Eastern Meadowlarks and Grasshopper Sparrows. Last month we released fifty Northern Bobwhites on four different farms in Swoope. We now have a pair in the yard and at least another male in the pasture to the north. Our neighbor has a pair as well. Will we see their chicks this year? We hope so. Shrubby habitat and native landscapes are key to bringing their populations back. Our cows will not be able to keep up with the growth of the forage in the pastures. 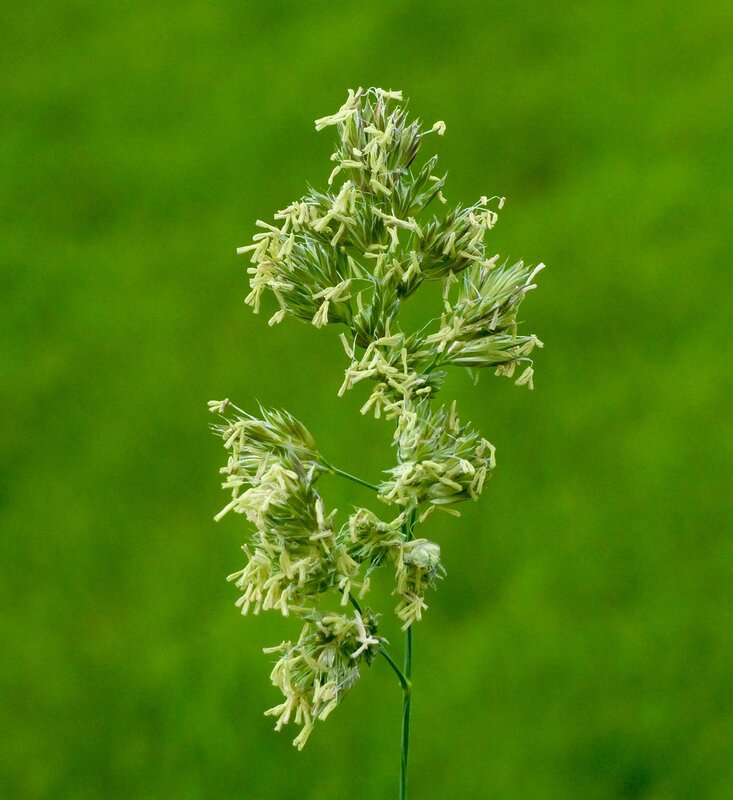 Orchardgrass has already headed out and is in anthesis – that’s when the anthers are out emitting their pollen into the air. I tell Jeanne, “That hay ought to be in the barn”. She gives me the ole “one-eye” look. We both know we’d never get it cured because of the rains and cool temperatures. Nevertheless, from a nutritional standpoint, it should be in the barn. Orchardgrass, fescue, bluegrass, and tall meadow oat grass are all in bloom emitting pollen which causes many people to have an allergic reaction called “hay fever”. They don’t really get a fever but the runny nose and itchy eyes come from the pollen emitted by the plants that farmers make for hay. 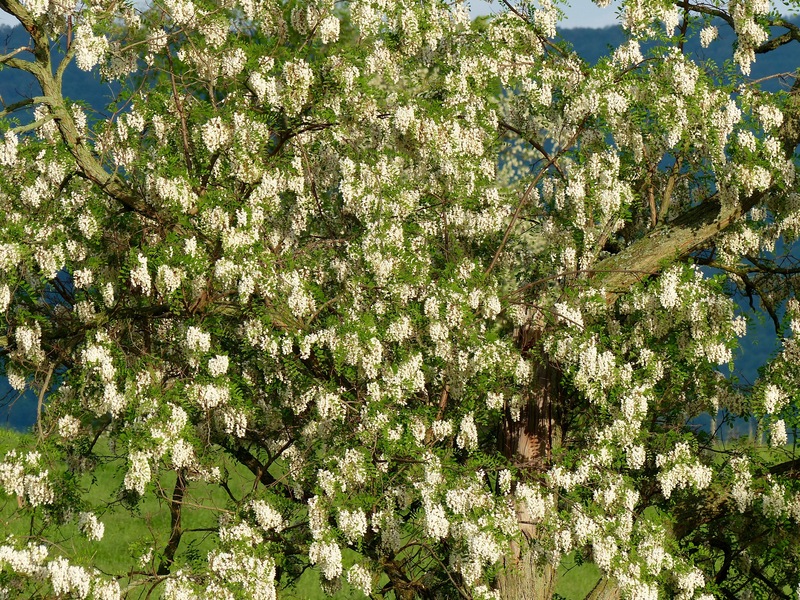 Black Locust tree in full bloom. Closeup of Black Locust flowers. 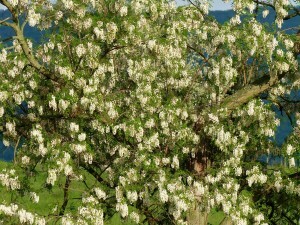 The Black Locust trees, Robinia pseudoacacia, are in full bloom. They are totally white with flowers. I can hear the bees on those blooms from afar; it’s like an interstate highway for pollinators. The flowers are an important source for honey. This native tree is awesome. It’s in the pea family and like all legumes produces its own nitrogen. Farmers use the timber from this tree for fence posts because the wood is very resistant to rot and the wood is dense making it ideal for firewood. This tree is also what we call a “pioneer” species which means it is one of the first trees to establish in abandoned fields. For wildlife, pollinators, utilitarian value and beauty, its one of our great native trees. Bobolinks, Bobwhites and Black Locust blooms are just a few reasons Swoope and the month of May are so special to me. Great Article Bobby!! I love this time of the year. We have had Baltimore Orioles playing around the house for two weeks now and have been hearing Whippoorwills over at the base of the Massanutten Mountain for the past week in the evenings! Thanks for reaching out Cory. Keep up the good work! We can’t hear Whippoorwills here, not close enough to the mountains. 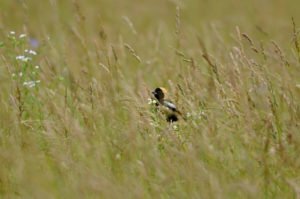 Bobby writing about bobolinks and bobwhites– surprised not to see bobcats in your musings! (haha) May is my favorite month too. Locust blossoms indicate that the crabs are running in the Bay. Isn’t phenology cool. Thanks for posting. Wish I had thought to add the bobcats. Thanks for sharing Bobby. Fisherman call this the “sweet of the year,” okay maybe a little earlier. 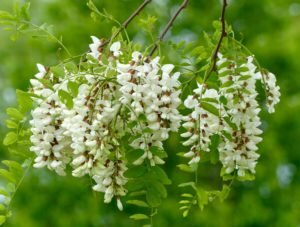 For eastern fisherman, the black locust in full bloom is a sign that the Green Drakes (ephemera guttulata) should be emerging in our clean streams. I have always wanted to know more about phenology and trout fishing. Thanks for reminding me. Yes, Bill, thanks. 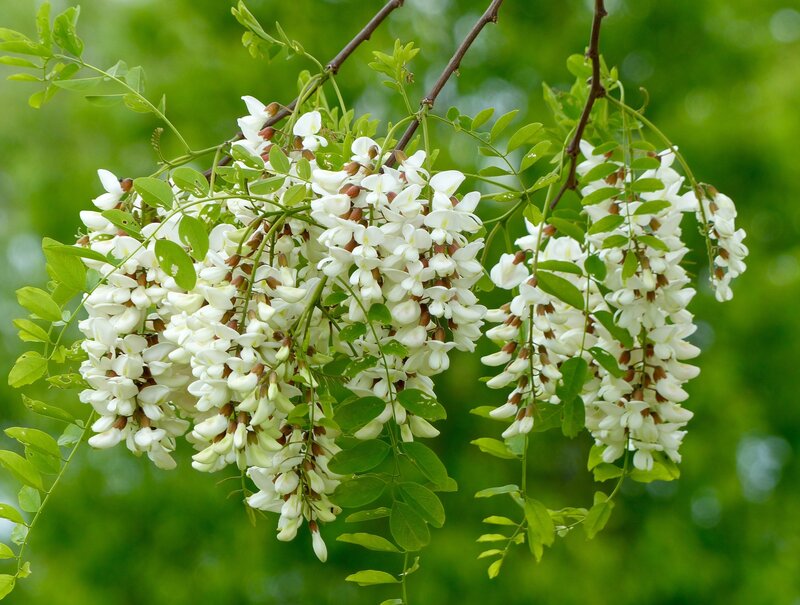 Did you see Sally Claggett’s comment that the Black Locust blooms also signals the running of the crabs in the Bay? The Black Locust blossoms also smell so good! Thanks for another fine posting, Bobby. Thanks for your kind words Megan. Love the info about the birds. Great post! John, thanks for your kind words, always appreciated. May may be my favorite month too, it certainly goes by faster than any other or it seems so. Busy working with the exploding growth, getting the garden in and preparing for hay making, foals coming, young horses to train and more to do that all the planning on the planet will help complete. We on the plateau are a little behind you folks in the valley. The locust bloom seems to be greater than most in recent memory. I wanted to add that we process locust into lumber for decking that is offered as a non-toxic alternative to treated lumber and also an alternative to rain forest species like Ipe. Not looking for business here, have more orders than I can fill. But, I would consider harvesting good locust or buying logs or lumber if anyone has any. Jason, thank you so much for posting and for all you do for sustainable living.